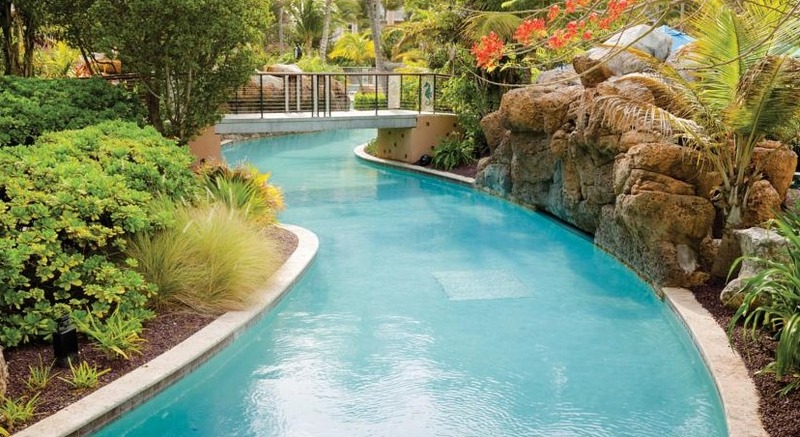 The lazy river winds around the resort. This villa-style property is a bit busier than the Marriott Aruba Resort and Marriott’s Ocean Surf Club located next door. The lazy river is the main draw here, but families will also enjoy spacious rooms with full kitchens, a waterslide for kids, and lots of activities ranging from tennis to snorkeling. At Marriott’s Aruba Surf Club, guests can choose between villas and bedrooms. Each villa is equipped with a full kitchen, washer and dryer. The bedrooms include a mini-fridge, microwave and cutlery. Rooms and apartments have a private balcony. Cable TVs with DVD players are included. Recreational facilities at the Aruba Surf Club Marriott include a hot tub and a fully equipped gym with cardio and weight training equipment. Captain’s Galley serves breakfast, lunch and dinner. Seaworthy’s Pool Bar is open for lunch and serves drinks in the afternoon. Visit Marriott’s Aruba Surf Club’s website for more information.